Aperture size: 0.35" (9mm) dia. Long life: 100 million cycles min. The low cost MINIATURE size mechanical light shutter /chopper model SH-35 is an ULTRA-LOW VIBRATION device that does not create shock or vibrations. It is useful when working on an optical table and is suitable to be part of an instrument or a system where a vibration free environment is needed. This shutter / chopper is easy to operate and is valuable when integrated into an OEM product. It is very cost effective in high volume. The device consists of a 0.010" thick aluminum black anodized blade mounted on a motor with a limited rotation angle to fit a 0.35" (9mm) aperture. The blade is also available in a bright nickel plating finish. Other thicknesses and finishing types are available. The total swing of the blade from one end position to the other end position is is 30 degrees. Transition from one position to the other is 5 mSec total. Transition is smooth, no clicking noise, no hard stops, and with minimal shock or vibration. 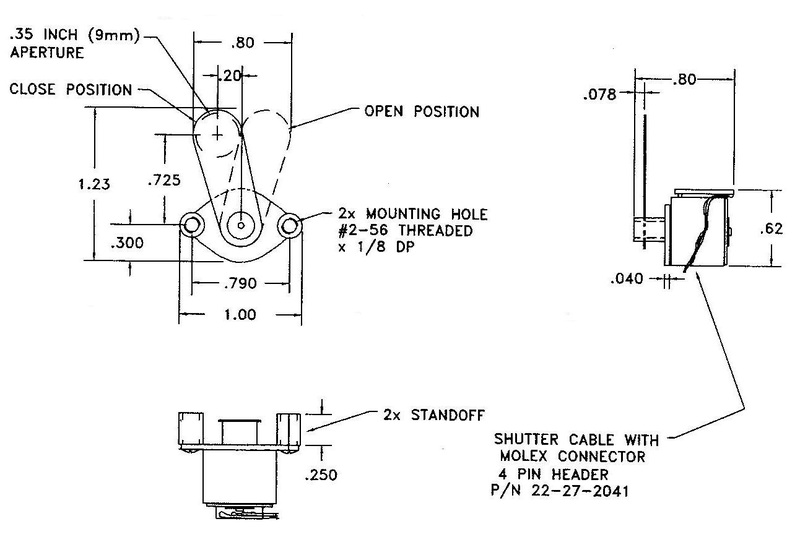 The shutter can also be used as a low frequency optical chopper at frequencies from DC to 50Hz. SH-35-M The shutter comes with a base without a front plate and allows horizontal and vertical mounting. SH-35-S The shutter is mounted with standoffs. 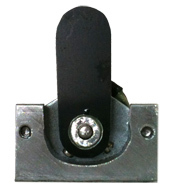 SH-35 The shutter is mounted on a frame that allows horizontal and vertical mounting. SH-35-M The shutter comes with a mounting plate and allows horizontal and vertical mounting. The DSH-35 driver is designed specially to control the model SH-35 shutter/chopper. In the "internal" mode the SH-35 is used as an optical chopper. The chopping frequency is set by the internal oscillator and is adjustable from 0.5Hz to 50Hz. In the "external" mode the SH-35 can be used as an optical shutter or as a chopper. A TTL input controls the blade position of the SH-35. A "High" TTL input (5V) keeps the shutter open. A "Low" TTL input (0V) keeps the shutter close. The response time of the shutter to the TTL input is 5mSec. The maximum TTL input frequency is 50Hz. EOPC offers drivers that enable the user to control the shutter with a TTL signal. Model DSH-35-110/220: A cased driver, 5.3" x 5.3" x 2", with a selector switch for operating from a line voltage of 110Vac or 220Vac. Example 1: PART NO. SH-35 with DSH-35-220. This part number specifies the model SH-35 shutter, with a 0.010" thick aluminum blade. The driver is cased 5.3" x 5.3" x 2", operating from a line voltage of 220Vac. Example 2: PART NO. SH-35-M with DSH-35-110/220-BNC. This part number specifies the model SH-35 shutter, with a 0.010" thick aluminum blade. The driver is cased 5.3" x 5.3" x 2", with a selector switch for operating from a line voltage of 110Vac or 220Vac, with a BNC connector for TTL input. Example 3: PART NO. SH-35-S-BRIGHT with DSH-35-110-BNC. This part number specifies the model SH-35 shutter, with a 0.010" thick aluminum blade. The driver is cased 5.3" x 5.3" x 2", operating from a line voltage of 110Vac with a BNC connector for TTL input. 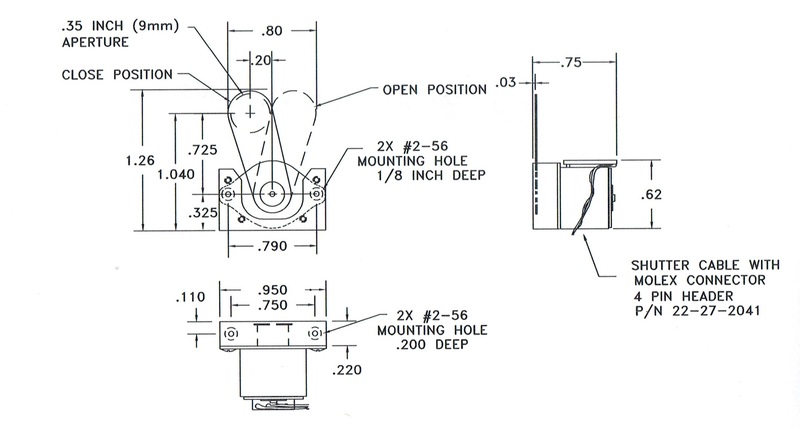 See CAD DRAWINGS (above) for additional information. © 1992-2018 ELECTRO-OPTICAL PRODUCTS CORP. All rights reserved.